No one can deny that water purifier has become a necessity in today’s life. The highly contaminated water has compelled all of us to make water purifier compulsory in our kitchen. So many factors are there to pollute water, especially the release of industrial and human wastes into the water bodies has forced the situation to be like this. And, as a result, you find the presence of heavy materials in the water along with TDS. Hence, the water purifier is a must thing to drink safe to stay safe. There are so many types of water purifiers that are available in the market. Wall mount water purifiers are the popular one but the Under Sink RO type is also gaining popularity day by day. We will give you the full details of these under sink RO water purifiers. So, why waste much time? Let’s know about these and choose the best one for your kitchen. So many people have opted for this under the sink type water purifiers. One of the main reason behind this choice is- the kitchen of each house is getting smaller. Under Sink Ro water purifiers, are specially manufactured to cope up with the recent modular kitchens and enhance them. This type of RO fits into a small place while doing the job of water purification. However, let’s know the types of these “Under the sink” water purifiers. This knowledge will help you to choose the correct one. 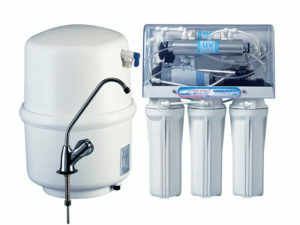 Two types of Under Sink RO water purifiers are available. It’s time to know these two types of filters in details. 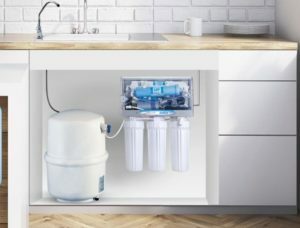 If you want to connect the water purifier in-line on the line of your normal source of water, then the Inline filter will be the best one. It comes with all the push fitting components. Though the installation process is a little bit tricky, still it is very useful. As these filters filtrate the water of your Kitchen sink tap. So, no additional tap will be required. This one is a single cartridge filter. But some upgraded models use multiple cartridges. 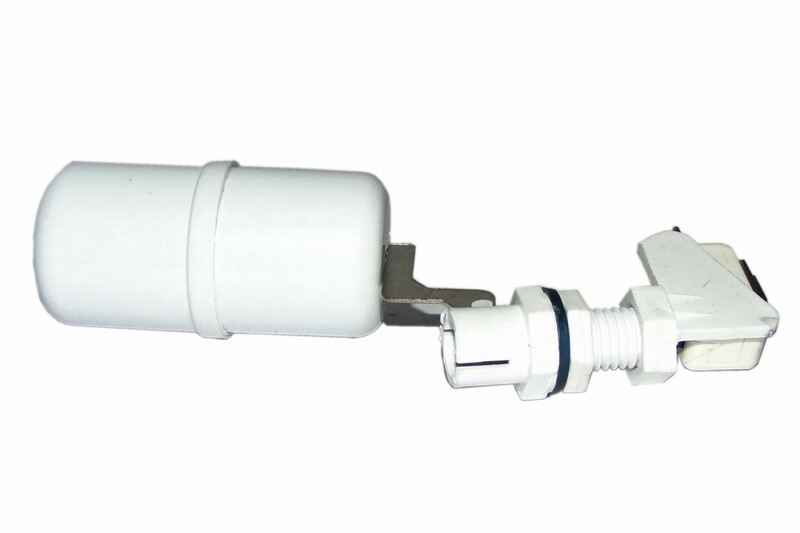 For this type, “Regular filter” water purifier you need to split the mains line just by a T-connector to install a separate filter tap. Because the work it does is nothing like in-line filters. This one is multiple cartridge filters. Now, you have the answer to your question, what is that under sink RO! But, it is the time when you should know about the advantages and disadvantages of this Under Sink RO. Scroll more to know. The Under Sink RO water purifiers saves a lot of kitchen counter space by staying hidden in the kitchen cabinets under the sink. A faucet or tap is there on the sink, just next to your regular kitchen tap. This convenient high curved tap is an easy way to fill your bottles. As in, generally, all the bottles get placed beside the sink. Moreover in case of water overflows from your bottle, you don’t have to worry about that because the extra water will directly go into the sink. If there is no electricity, still you will get purified water. Because water comes out from that faucet with good pressure and flows as the hydrostatic air pressurized bladder tank stores the water under the counter. So, the hydrostatic pressure in the tank remains good always. In the case of electricity issue, you will still get the purified water. The Hydrostatic tank of these Under Sink RO water purifier stays always filled up, and it never fails to supply you purified water. Moreover, the pressure of the water will be good enough because the water stays in the tank with the full pressure of the electric pump of the under sink RO unit. Gravitational law works in the wall mounted water purifiers. So, it’s obvious that it takes much time to fill a bottle than the under sink type water purifier. Also, at the time of filling bottle you have to be careful about the spillage of water as in water, falls n the floor. There are no design limitations applied to these Under Sink RO water purifiers. The full size is 10-inch sediment and activated carbon pre-filters are used here along with the bigger air bladder pressurized water storage tank. Since there is s many limitations in the wall mounted water purifiers because it has to fit in a cabinet or something like that. So, all kind of small parts is used in these RO. Even if you get some non-standard size water purifier, they are quite expensive. But these don’t happen with Uner Sink RO as there is no limitation of size. So, it’s always a good option to purchase “Under the sink” RO water purifiers. It is always better to know about all the advantages and disadvantages of a machine, before buying it. As you already know about all the advantages of this Under Sink RO water purifiers, but its time to know the disadvantages. As per the nature f water filters, it also installed at a single point of use. So, this purifier will provide purified water through a single source only, like a tap or faucet. In case, you want that all of your taps give you purified water then you have to install a whole house filter. Another biggest disadvantage is, you have to install a separate tap at the time of using these water purifiers. If you want something alternative, then yes, there is another scope also. You may have a three-way kitchen sink tap that can dispense hot water, filtered water and cold water from a single outlet. However, if you have set your mind to buy an under sink RO water purifier, then you must check the list of best Under Sink RO. Several Under Sink Water Purifiers are there, but some of them have that ability to grab our eyes. So we prepared a list of the best three water purifiers. Check now and complete your purchase. Whenever we say water purifier, Kent always comes in our mind first. Being the most popular brand it has held its position in a very convenient way since it came to market. Under The Sink category products also left a good remark in the industry. However, Kent Excell+ is one of the best purifiers among those under the sink types. It works on Kent’s patented Mineral RO Technology, along with an in-built TDS controller. Moreover, the capacity of 7 litres makes sure that you never run out of purified water. The Mineral RO technology is here to take care of the essential minerals. The double purification of RO and UV/UF ensue that you get 10% safe water all day. However, you can claim free services for 4 years back t back that also includes one year of manufacturer guarantee. As the other RO does, it also wastes water. As far as water purifiers are concerned, the A O. Smith X5 is one of the bests. AO. Smith water purifiers received a grand welcome from the industry. And Under Sink RO from this company, didn’t fail to set a benchmark. The storage capacity of 7.5 litres provides water to your full family. The 5-stage water purification process is another best thing that helped this RO to be best. Moreover, you will get purified water with a TDS level up to 2000ppm. And the state-of-the-art RO membrane technology helps you to drink safely. Have a look at the Pros and cons of this water purifier now. No UV/UF purification, only RO purification technology is used. 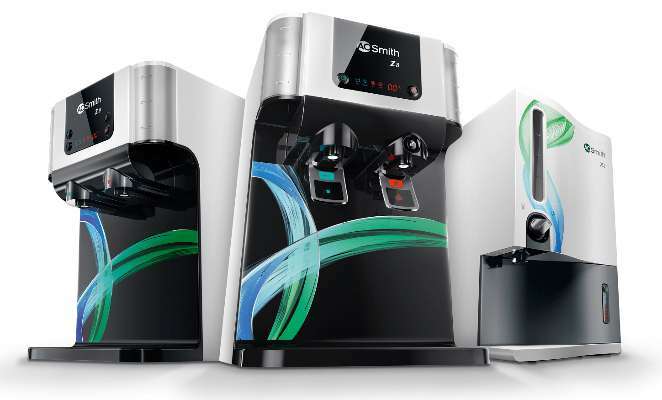 If you want something small with same purification technology, then you must go for the AO Smith Z2. As in it has 5 litres of water capacity along with the SideStream RO Membrane- that takes care of the safety. Main positive side f this RO is that it reduces water wastes that you may find in other RO. Instead of UV/UF purification, it has RO purification. That’s all from our side. Now you need to choose the one that will fit into your requirements. Before purchasing any under Sink RO Water Purifier make sure that you have gone through all the features of that RO. If you think that, it will meet all of your requirements only then go for it. Else, you will get a lot of options to try. You can try our complete post to Check TDS Level Water. Going to purchase a new water purifier? Then, you have mostly heard about the TDS level in Drinking Water, right? If you have a little knowledge about what is TDS! Or how to check TDS level water! Then we will ask you to keep your worries aside and scroll. When it comes to purchasing a new RO you must check the efficiency of the TDS controller and the mineralizer. If the rate of the TDS controller is able to discard the needed amount of total dissolved solids, only then you should go for that Water Purifier. But for that, you need to check the TDS level of your source of water firstly. Only after determining the level you can be sure about your water purifier’s monitoring of TDS in Drinking water. However, we know that everyone is not a lab specialist. And that’s why we have jotted down some effective home remedies to check TDS Level Water. If you have a clear idea of what TDS level of water actually is, then it will be easier for you to perform the process of checking the level. So, what is this TDS? 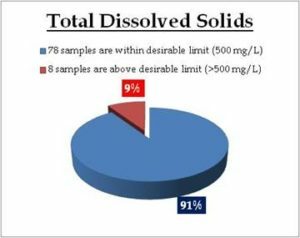 Well, the abbreviation of Total Dissolved Solids is known as TDS. The formula of water is H2O, as in, each of the molecules of water contains one Hydrogen atom and two Oxygen atoms. And this is called pure water. But when there are some impurities in the water is called TDS. These impurities can be anything like organic components or inorganic components. Both of these materials are Hazaras for your health. Generally, abandoned sources of water containing a high level of salts like calcium, sodium, potassium, carbonates, fluorides, sulfates and many other substances. However, it’s a long list literally. So, what do these components do?- Whenever you intake more than a certain percentage of these minerals it causes you to suffer from many water-born diseases. Not only these inorganic salts but also the heavy metal impurities are included in the list of TDS. The water sources contain a huge amount of arsenic, antimony, mercury, and lead. These chemicals are very dangerous for your health. So, in this kind of situation, only water purifiers can help you to drink safely each day. And whenever you go for an RO, you need to check the efficiency of that water purifier to make sure it can eliminate most of the TDS from your drinking water. So, no need to mention that you need to check the TDS level firstly to determine what RO will be perfect for your source of water. Is TDS Necessary For Your Health? So many times we have heard that is TDS necessary for our health? Actually, yes it is necessary but only up to a certain percentage. Whenever you intake more than that it will hard to prevent diseases. Moreover, you may think that pure water is the ultimate thing to achieve a healthy life. But you are wrong my friend. Pure water has no taste, no odor, and no salts. But the salts like magnesium, sodium, calcium, or potassium are really needed for our health. As these compounds help our growth. So, what to do in this situation, like- if you intake less you are going to be ill, if you intake much then also you are going to be ill! Tough choice, right? Only, determining the exact TDs level and drinking it can help you. Look below to know what are the barriers for TDS level of water! According to the Bureau of Indian Standards (BIS), the acceptability of TDS levels in water is as follows. If you intake the water with less than 50 TDS level then it will be unacceptable. Because such a low percentage of TDS fails to contain the required minerals for healthy growth. For water with TDS level 50 to 150, it is acceptable with a slight sense of deniable. however, this water includes some pollution from industrial wastages. So if you think 150 mg/L will be em=nough for your health then you are wrong. As in this proportion is going to reduce after the purification. A range of TDS level between 150 to 250 is considered as the healthiest as far as the cardiovascular health is concerned. There are many places, which has 250 to 350mg/L amount of TDS in the groundwater. It is a fairly acceptable level. BIS has prescribed that the water with TDS level 350 to 500 or a slightly more than 500mg/L is perfect for human consumption. Above 500 to 1200mg/L TDS level is completely unacceptable for a human. If you purify this water and after that, if the level drops down to 500mg/l or less than 500mg/L then it’s ok. You can drink that water. Water having a TDS level of more than 1200mg/L is utterly unfit for a human being. Hence, it is proved that by hook or by crook you must have the proper level of TDS in water. Else, no one can prevent the consequences. So, must be getting anxious to know how to check TDS Level water! Alright, look below for the answer now. How To Check TDS Level Water? 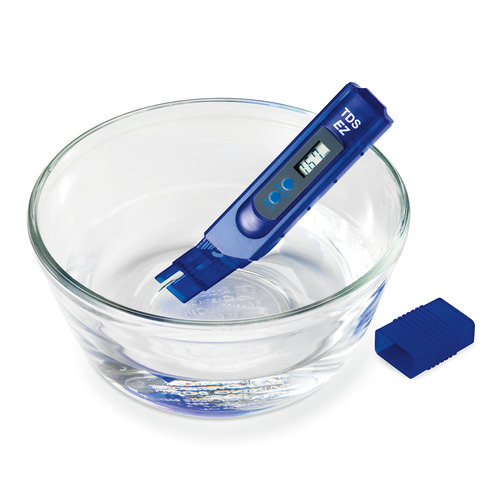 Several methods are there t measure TDS level in the water. Some of the easy tricks are given below. Have a look and fund out now the TDS level of your source of water. It is one of the easiest ways of measuring the TDS level in the water. The main thing is you don’t have to take and reading or don’t need to calculate anything to find out the exact value of TDS level. You will get the immediate result on this device. So, no one can deny that this effect of the Digital TDS Meter has marked it as the best. However, let’s know how to use this? Well, you need to look down for the answer. This process includes two major steps. Firstly you have to measure the temperature then you can measure the TDS level. That’s all! You are done with the checking process of the temperature. Now, it’s time to measure the TDS level in drinking water. To do so, follow the below steps. You are done with measuring. For your information, some of the TDS meters show X10 symbol, in this case, you need to multiply the reading with 10 to get the exact value. Furthermore, always keep in mind that the TDS meter is not completely watertight. So, you should never dip the meter above the immersion level. And one more thing, we will forbid you to not to expose it in direct sunlight. If Digital TDS meter is not your thing then you must look for another process of measuring it. And, you have to look below for that. 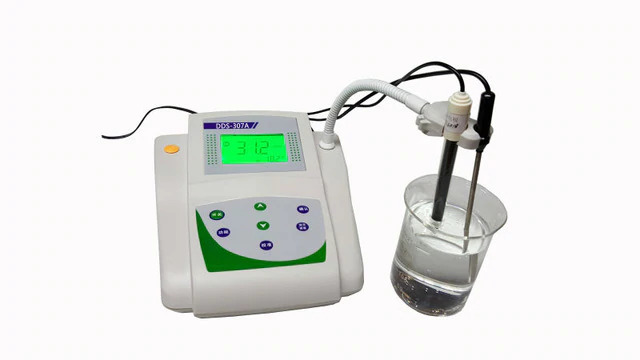 As you already know that TDS includes inorganic salts, so, Electrical Conductivity Meter can be another better option to measure the TDS level of water. However, follow below steps to check TDS level water by this method. Before proceeding towards the process you need to keep some stuff handy. If you are thinking that why do you need these stuff? Then let us clear the air. 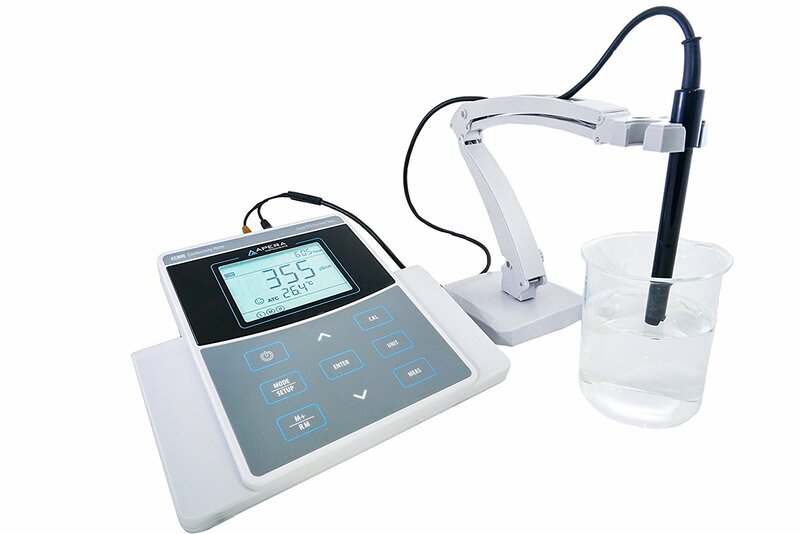 The electrical conductivity meter has the ability to release an electrical current into the water and measuring the resistance. So, yes, these apparatus are important. Anyway, now it’s time to measure the conductivity. For that, firstly you have to make sure that you have placed the beaked on a flat topography. Then, switch on the conductivity meter and immerse the measuring lead into the water. Now, note down the reading as soon as it gets stabilized. It will take some time to be stabilized s, don’t panic thinking there is something wrong and the reading is not getting stabilized or something. The measurement depends on the measurement of pure water. It is being measured in the Micro Siemens unit. And pure water(H2O) has 0 Micro Siemens. Now you will get the exact TDS value of water. You’re done with the procedures of Checking TDS level water. since we have described both of these convenient processes, you can try one of them now. So, make sure that you have checked and found out the exact TDS level of water and then only go for buying a water purifier. We will like to remind you again that, all these total dissolved solids are not Hazaras for health. It only hurts your body when you intake more than a certain percentage. So, cut down the amount of TDS intaking today and live healthily. Kent has become the household name since it came to the market. And day by day the company is upgrading their Water Purifiers to provide your safe water each day. They know the condition of water of recent time, as in mostly you get contaminated water that doesn’t worth drinking. Hence, a large number of people have chosen Kent to secure a healthy life. And, when it comes to the variations of Kent water purifiers, the Kent Ace Mineral 7-Litre RO + UV + UF Water Purifier has stolen the show. If you are going to purchase a new RO but still confused thinking what to choose then here is the expert’s Kent Ace Mineral Review. Scroll now to know every pros and con of this one of the best water purifier. Additionally, know the field of expertise of this Kent RO. And only after that go for it. What are you waiting for then? Here is a clear overview. Go through now. 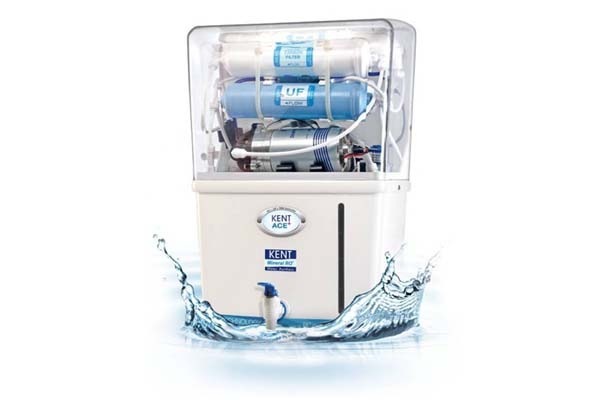 Kent Ace Mineral 7-Litre RO + UV + UF Water Purifier is an outstanding model from the brilliant range of Kent purifiers. It has the most efficient TDS controller that ensures you safe water 24/7. Not only the safety but also, this purifier provides you with tasty and hygienic water. The ABS food grade tank stores up to 7 liters of water to make sure you never run out of purified water. Moreover, the attractive design of this Kent Ace Mineral enhances your kitchen. The sleek and portable shape of this water purifier lets you fit it into wherever you want. The double purification technology guarantees 100% safe water and the TDS controller takes care of the essential mineral. So, no matter whatever the source of your water is, like a tank, borehole, or corporation, Kent purifies each type of water and makes it drinkable. This ISI, NSF, and WQA certified purifier always focus on the fact that, the water must meet all of your safety requirements. All the germs and microbes get discarded by the high power 11 Watt UV lamp. The fully automatic operation make sure that you get the Filter change alarm and UV fail alarm. If you have a fluctuating voltage then the built-in SMPS is here to handle that. This SMPS can bear a wide range of input AC voltage from, 100 volts to 300 volts. However, now have a look at the features and the 7 stage purification process of this Kent Ace Mineral Water Purifier. The robust ABS Plastic is in the outside of this Kent Ace purifier. The plastic is quite durable and the quality is so awesome that it lasts longer. The food grade quality of this plastic maks sure that the water is completely toxin free. This wall mounted model saves space for your kitchen counter and never fails to supply you hygienic water. Moreover, you can easily monitor the water level by seeing the tank. This Kent Ace Mineral Water Purifier consumes less energy than other water purifiers. So, undoubtedly this is high on money-saving as it consumes only 60 watts. The in-built SMPS is specially designed to cope up with the fluctuating voltage. As in, it makes sure that the electricity that goes into the unit is completely free from the spikes and of course the fluctuation. When there is any spillage your water purifier may stop working. The Kent Ace Mineral Water Purifier has invented a new technic to prevent this issue. They have used the all push fit type components in this particular purifier. These rubber O-rings of the push fit components guarantee you 100% leakage free service. 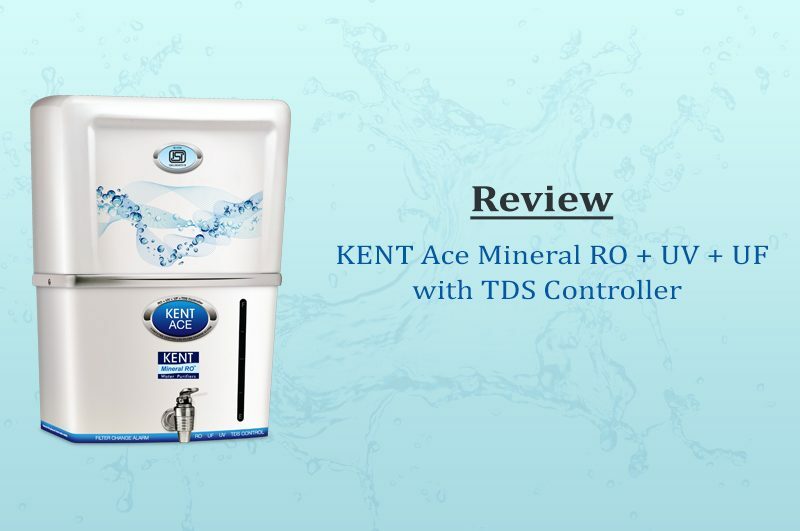 This Kent Ace Mineral 7-Litre RO + UV + UF Water Purifier has used some exclusive technology- the ROTM patented technology. It allows you to adjust the TDS level as per the condition of the TDS level of input water. So, any type of water from any kind of source becomes purified with this purification technology. The computer controlled technology helps you to be tension free about when to start purification according to water level or when not to! However, this technology stops purification on its own when there is no input water and the water reaches the highest level in the purified water tank. When the level of water comes below the maximum marking of that purified water tank, the process of purification starts again. This purification process removes all the traces of harmful elements from your drinking water. Kent makes use of the replaceable filters along with the state-of-the-art patented RO technology. And that plays a major role in supplying you purified water. However, look at the purification process now. The stage is a sediment filter. In this stage of purification water fed into the filter. the And main motive of placing this filter inside you RO is to remove all the large particles, pollution, hazards elements, and suspended solids. Fine sediments can easily bypass this filter. So, for that Kent Ace Mineral has another trick. The second stage of purification includes this activated carbon filter. The residue water of the first stage goes through this carbon filter to remove the volatile compound, chlorine, and organic compounds. Not only the compounds but also the unpleasant taste and the odor get removed in this process. As you know, carbon is very effective when it comes to eliminating impurities. Hence, as a result, the water gets a much purer form. A semi-permeable membrane is used in this stage named as RO Filtration. In this process, all the dissolved impurities and organic solids like salts get dissolved. Furthermore, this process removes other contaminants effectively. A pressure of 30-40 psi is applied to the water molecules in this stage so that the water passes away through the membrane and leave the impurities behind. All the macromolecules of water get trapped by the UF membrane in this stage. To make water purer, all these molecules are discarded. However, the por5e size of the UF membrane is quite small, like 0.01 micron. So, isolating the impurities is not hard work. These impurities are invisible to your naked eyes. The fine threads of fibers are used in this technology and no need to mention that it is very effective. The Total Dissolved Solids are controlled by this TDS controller. The RO process reduces the hardness of the water as well as it removes all the essential minerals from the water. This TDS controller ensures that all the essential natural minerals get replenish in the purified water. The Ultra Violation technology of this water purifier discards all the bacteria, virus and other disease-causing pathogens. We all know how much this is essential, right? The 11 watt UV lamp compel the water to pass through ultraviolet radiations. It kills or inactive all the microorganisms to make the water free from germs and unhygienic stuff. Now you know all about the Kent Ace Mineral 7-Litre RO + UV + UF Water Purifier. It’s time to know what the experts say about this water purifier. Look below to find out their view. We have jotted down the Kent Ace Mineral Review in the form of pros and cons of this particular water purifier. Scroll, now. Look below to know the positive sides and negative sides of this Kent Ace Mineral. This information is all based on hundreds of reviews, you can even check out RO Water Purifier Not Working, Water Purifier Maintenance AMC and more. Due to the contamination and pollution, it’s unsafe to drink non-purified water. All of us agree to this fact, right? And that’s why we opt for a water purifier always. When it comes to the Water Purification, AO Smith Water Purifier has stolen the first place to provide us with healthy water as well as a healthy life. So, if you want to obtain clean and healthy drinking water all the time, then you must go fo the AO Smith Water Purifier. Now, if you think that why you should buy it? Or will it be reasonable? Then we must say, you should check our buyer’s guide. Yes, we have crafted this guide, keeping your requirements in mind. So, know the functional area of AO Smith water purifier, best prices, and coverages within a few scrolls. What are you waiting for? Scroll down and make a note. Complete your purchase and live a healthy life! The American Multinational Company- AO Smith, has gained the popularity by rendering best heaters and geysers. But now, they have made a revolution by manufacturing water purifiers in the segment of home appliances. The advanced 5 stage RO guarantees you 100% purification system. The purification rate stands at an average of 15 liters per hour! So, nobody can deny that it is one of the best water purifiers that are currently available in the market. Now, you got it right? That, yes, the AO Smith Water Purifiers worth your trust. However, if you want a more clear view, then you should know about the broad collection of water purifiers of this company. Now, it’s time to know the technology of purification that is involved in these three types of water purifiers. Have a look to know these purifiers closely. Which one you think, meets your requirements- hit the purchase button. The AO Smith i1+ digitally advanced RO + MIN-TECH technology water purifiers were firstly introduced with this I-Series. If you want something that fits into your modern kitchen environment, then you must go for this i1+ water purifiers. The dual color components go easily with your modular kitchen and reflect your status and of course, the taste of choice! Anyway, let’s know why you should take these i1+ purifiers home? Well, we would like to draw your attention to the purification process of I-Series purifiers. This process includes 6 different stages- know the mechanism below. Sediment Filter- It discards the large and visible particles or impurities. SCB Filter 1- The fine sediments gets removed here that tricks the first filtering process. SCB Filter 2- This filter traps all the organic and inorganic impurities. Side Stream RO Membrane- All the harmful metals get removed here. It also eliminates the TDS up to 2000 ppm. Silver Activated Post Carbon filter- It removes all the left traces of organic and inorganic components also it plays a big role to make the tase better. Min-Tech Technology- The final stage of purification adds all the essential minerals that are needed for your health and balances the pH level in order to taste the water better. All of those go for the I-Series. 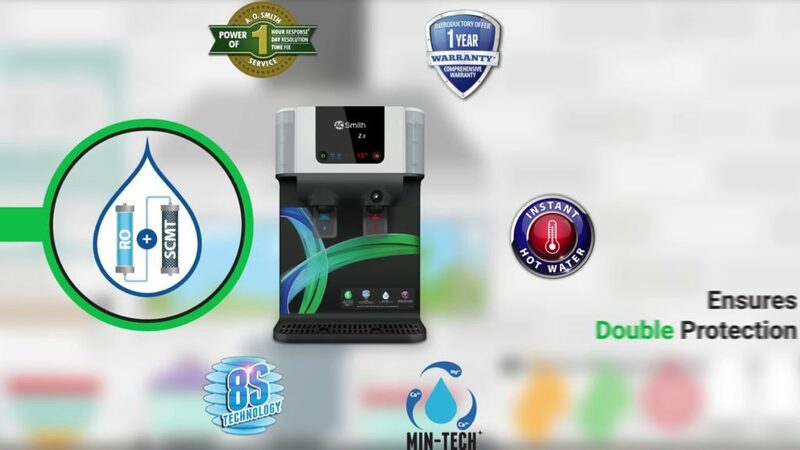 If you want to experience something better then go for the X-Series Water Purifiers that has left a special remark on the collection of AO Smith Water Purifiers. The environment-friendly collection of water purifiers, belong to X-Series. Not only this special feature but also you will get some amazing aesthetic designs under this X-Series to enhance the beauty of your kitchen. These type of AO Smith Water Purifiers ensure you 100% purified water that passes through the RO membrane. And, the 6 step purification process makes it more convenient. Have a look at the purification technology now. Sediment Filter- This process does the same as I-Series. Removes the large particles. SCB Filter 1 and SCB Filter 2 both of them do the same as I-Series. Side Stream RO Membrane- Removes TDS up to 2000 ppm and discards all the harmful industrial wastes like antimony, arsenic, and lead. SCM Tech 1- It removes all the traces of impurities. SCM Tech 2- This process restores all the essential minerals that were lost during the purification. If you want a water purifier with more stage of purification then you must go for the higher end models like X8 that comes with an 8-stage purification process. Now, it’s time to know about the Z-Series water purifiers. There are some exclusive purification features included in this Z-Series Water Purifiers- it uses the UV Lamp for the purification instead of RO technology. And this UV Lamp makes sure that there is no trace of bacteria or microbes in your drinking water. But one thing you need to keep in mind before going for this Z-Series water purifiers that, there is not much TDS in the input water. The Z-series AO Smith water purifier discard the TDS up to 200 ppm and hardness up to 120 ppm from your drinking water. Apart from this, it also obtains hot water at two different temperature, 450C, and 800C. The 5 stage purification process has helped the Z-Series to stand apart. Pre-Filter- Mud, rust from pipes and all the large particles are removed in this pre-filtration process. Sediment Filter- All the microscopic contaminants get eliminated by this process. Silver Activated Post carbon- The anti-microbial qualities of silver are used by Z-series AO Smith water purifiers to remove all the microbes and bad odor. UV Lamp- All the viruses and bacterias get destroyed from your drinking water by the UltraViolet lamp. UFSS (Ultra-Fine Stainless Steel)- You will get hot water at 450C and 800C by this process. Night Assist Feature- This feature helps you to find your purifier at night by glowing a lamp. If you want more advanced purification then you must opt for the Z2+ and Z8 series of this category. Now, you know all about the series of AO Smith Water Purifiers. Let’s have a look at some of the best purifiers from this company. Some water purifiers are there. But some of them has that special quality to stay long at your kitchen. And, we have jotted down all the details about those best water purifiers. So, check out the list now and find the one which serves your all purpose. The advanced Z-series AO Smith water purifier model, Z8 doesn’t have any kind of UV lamp. But it uses the RO purification technology to provide you with pure water. It also replenishes the lost minerals successfully by Mineralizer. So, you can bring this printer home- 100% safe water is guaranteed. However, this water filter uses the Advance Recovery Technology, commonly known as ART. This feature ensures minimum wastage of water. So, you can make sure that the input water will be 90% used to serve you purified water. Now it’s time to know why you should buy this water purifier? The Z8 series got an upgrade and came up with more captivating features. These upgraded purifiers are named as Z9 Series AO Smith Water Purifiers. These purifiers are fully infested with features, as in, all the Z8 series features are included along with some new technology. Moreover, the fascinating design of Z9 purifiers complements your kitchen. Let’s know why this purifier is worth buying. Guys, you can also go for the I-Series and X-series water purifiers. As Z-Series purifiers are the best- we represented all the features of these AO Smith Water Purifiers. Now choose wisely, what will be best for you! And hit the Buy Now button. As per the AO Smith purifier reviews, these purifiers have left a noticeable remark in the business industry. A huge number of people have liked these purifiers. You can also be a part of this large community by purchasing one of these AO Smith Water Purifiers.